Most of you are probably not going to have a clue what I'm talking about when I mention the Carry On films because they are old British comedy films filled with jokes so bad that I can't even groan. I just roll my eyes and shake my head. Yes, Denis introduced me to them, and there's only one line from any of the ones I've seen that I like. From Carry On, Cleo, Caesar shouts, "Infamy! Infamy! They've all got it infamy!" [In for me] And that's how I feel about rubber duckies: Everyone's got it infamy. Friends see yellow rubber ducky pool floats at WalMart and post a photo of them on my Facebook page. It seems that any time one of those things is spotted-- you guessed it-- it, too, winds up on my Facebook page. I'm haunted by those yellow plastic creatures, and it's only getting worse. To quack or not to quack...ACK! You see, our Daisy turned twenty-one last week, and she went to Stratford-upon-Avon for the day. 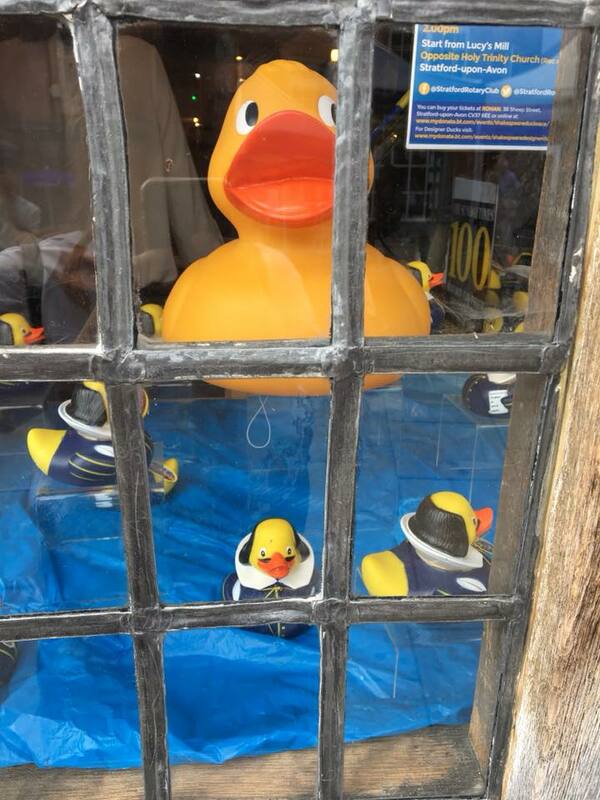 While wandering the streets made famous by the Bard, guess what Daisy spotted in a shop window? Shakespeare Duck. Guess what she did? Yep. She took a photo and posted it on my Facebook page. Guess what Denis did? Yep. He found one for sale on Amazon and ordered it. He also found Batduck and Bagpiper Duck. By the time that man gets done, there might be room in the pool for me. If I'm lucky. And all because Denis had to have three in the pool and silly me started taking photos of the critters. And posting them on my Facebook page. I tell you, not only do they all have it infamy, I'm on the verge of going quackers! I'd better head on out to the corral and hope the feeling goes away. Head 'em up! Mooooooooooooove 'em out! Ausma Zehanat Khan, the founder of Muslim Girl magazine, now writes fiction inspired by human rights, migration, and identity. The writers diversifying detective fiction. Poisoning Agnes Sorel: a 500-year-old cold case heats up. Introducing It Was a Dark and Stormy Book Club, a mystery lovers podcast. 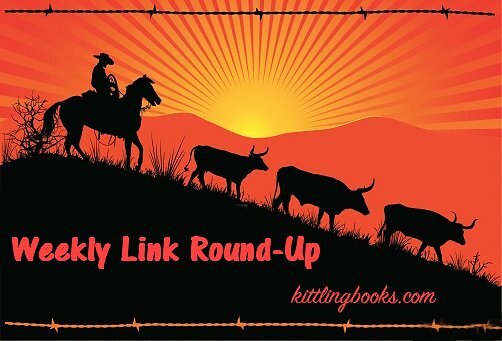 Literary nonprofits using books to make a difference. Where the "no ending a sentence with a preposition" rule comes from. Why medieval monasteries branded their books. A power company project has become one of Europe's largest archaeological digs. Mysterious "devil coins" have been discovered in Bath Abbey in England. A Neolithic roadway, possibly a ritual site, has been discovered in England. How ancient teeth reveal the roots of humankind. In addition, bacteria in those old teeth have also pushed back the origins of the Bubonic Plague. A new website unearths Amsterdam's history via 700,000 artifacts spanning 5,000 years. It's pooches vs. poachers in the fight against wildlife smugglers. How we elected T. Rex to be our tyrant lizard king. You've got to love karma: lions ate three suspected poachers at an Eastern Cape reserve in South Africa. A historic California ghost town is up for sale. North America's most spectacular waterfalls. Take a 3D tour through Frank Lloyd Wright's Taliesin West. Crime and the city: Manchester, England. Route 66 and ten other sites that made the 2018 "Most Endangered Historic Places" list. Seattle through twenty-one crime novels. Eight gritty crime dramas that ditch the violence against women. Seven authors on the books they're packing for their summer vacations. Cara Black: Five books that reveal Paris. Summer's most anticipated crime, mystery, and thrillers. Nine of the all-time great (fictional) swindlers and grifters. Seven nominees for the best tree in literature. Crime fiction's best (and worst) meals according to Martin Walker. Makes sense to me, although I did start out by reading true crime. That is, after I OD on historical fiction. Love the continuing duck stories!! These ducks are going to start haunting my dreams. If I took baths, rather than showers, I might even own one. Lots of good lists of books and TV shows. I admit I binge-watch good mystery series. I did that with the Australian Janet King episodes. I'll have to look up those Janet King episodes. Right now I'm bingeing the Dr. Blake mysteries.